Work more safely by flooding your work zone with this economical and powerful work light. 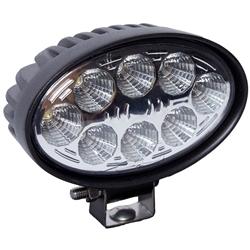 This convenient floodlight projects 1800 lumens using eight 3 Watt LED bulbs. A single bolt mount allows you to rotate the light in the direction needed. It also tilts vertically so you can provide light exactly where it is needed so you can see your work in any weather. Please allow for an additional 3-5 business day processing time on this item. 5.75" x 3.5" x 2.4"